The VFC-9-200-2 Feeder Cube is a triple control for operating a vibratory bowl with a storage hopper and an inline. 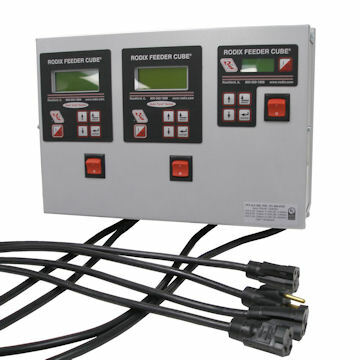 Unit A is a VF-9 variable frequency controller and units B & C are FC-200 fixed frequency digital controllers. Input voltage is 120VAC, 50/60 Hz. Output for Unit A is fused for 9 amps, Units B and C are fused for 5 amps each. Vibration sensors are sold separately. The VFC-9-200 Feeder Cube is a dual controller for operating a vibratory bowl and storage hopper or a vibratory bowl and a linear inline. Unit A is a VF-9 Variable Frequency controller; Unit B is an FC-200 Feeder Cube. Input voltage is 120VAC, 50/60 Hz. Output for Unit A is fused for 9 amps, Unit B is fused for 8 amps. Vibration sensors are sold separately. 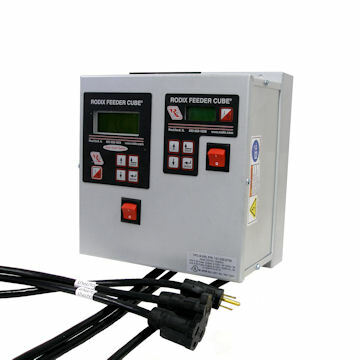 The VFC-9-2-200 is a triple controller in a general purpose enclosure with two variable frequency VF-9 controls and one FC-200 Series control. UL listed (File E183233). Input voltage is 120VAC, 50/60 Hz. Output voltage is 0-120 VAC. The rated output current for Units A and B is 9 amps and the output frequency is 5-300 Hz. The rated output current for Unit C is 5 amps and the output frequency is 50/60 Hz. The VFC-3-200 Feeder Cube is a dual controller for operating a vibratory bowl and storage hopper or a vibratory bowl and a linear inline. 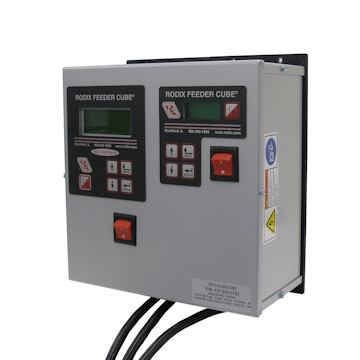 Unit A is a VF-3 Variable Frequency controller; Unit B is an FC-200 Feeder Cube. Input voltage is 120VAC, 50/60 Hz. Output for Unit A is fused for 3 amps, Unit B is fused for 8 amps. Vibration sensors are sold separately. 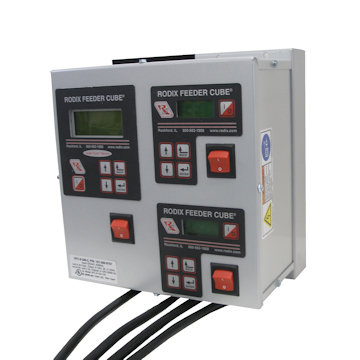 The VFC-3-200-240 Feeder Cube is a dual controller for operating a vibratory bowl and storage hopper or a vibratory bowl and a linear inline. 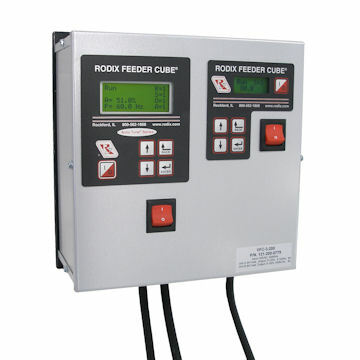 Unit A is a VF-3 Variable Frequency controller; Unit B is an FC-200-240 Feeder Cube. Input voltage is 240VAC, 50/60 Hz. Output for Unit A is fused for 3 amps, Unit B is fused for 8 amps. Vibration sensors are sold separately.